BIRD ON BRANCH BIRDBATH SUNDIAL. Bird On Branch Twig Birdbath Sundial W/ Tree Base. Roman Numerals Cast Into Top Edge For Sundial. 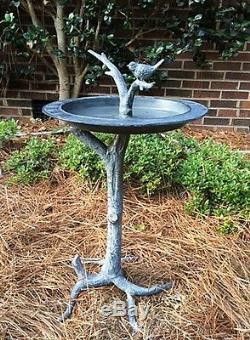 Can Double As A Birdbath Or Bird Feeder. Hand Finished Antique Verdi Blue Green Patina. Weather Resistant Powder Coated Finish Help Protect Against The Elements. Due To Hand Finishing Process & Various Monitor Settings, Finish/Color May Vary From Stock Photos. Crafted Of Aluminum Rust Free. Measures Approx: 27"H x 15.5"W x 15.5D. Tracking Information Will Be Emailed Once The Item Ships. All items are in stock when listed, but due to popularity, this item may sell out. 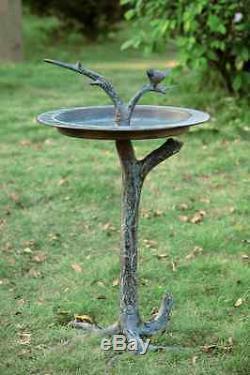 The item "Bird On Branch Twig Birdbath Sundial Sculpture Garden Bird Bath Feeder" is in sale since Thursday, August 01, 2013. This item is in the category "Home & Garden\Yard, Garden & Outdoor Living\Bird & Wildlife Accessories\Birdbaths".